Today marks the beginning of the Discovery Channel phenomenon known as Shark Week. Believe it or not, it originally premiered on July 17, 1988 and is now the longest running cable television programming event in history. Congratulations to Tom Golden, who came up with the concept although I won’t hold all those Sharknado movies against him. Although I fish, boat and swim in our waters on a regular basis, I don’t have any scary stories or shark encounters to share. 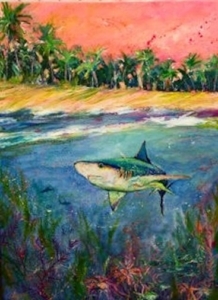 To the contrary, I’ve caught black-tip sharks off the dock behind the gallery and always release them back into the water. One day, I caught a black-tip and released him. Ten minutes later, I caught and released him again. Fifteen minutes later, he was back on the end of my line. After catching and releasing him so many times in a single sunny afternoon, I consider him a member of the family! The other is “Old Hitler.” No one knows for sure if he’s real or a legend like the Loch Ness Monster. If he is real, he’s more than 20 feet long and about 70 years old. 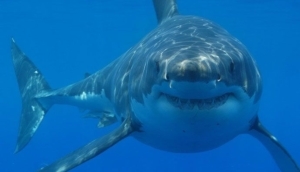 He’s such a phenom that there’s a whole show being devoted to him by the Discovery Channel during Shark Week this year. (Hint: they never really find him, although there’s evidence of a huge hammerhead patrolling the waters off Jupiter that fits Old Hitler’s description). So, look, we all know that sharks are super-predators. 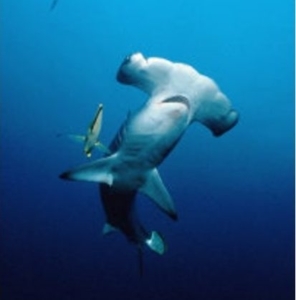 But their numbers are rapidly diminishing because of overfishing and our baseless fears about being eaten alive. Too bad, because they are magnificent creatures. It’s just that they get hungry sometimes.